Together with the Marine Conservation Society, we brought eight pupils from Our Lady’s Primary to the Scottish Parliament to talk to decision-makers about the Wild Bottle Sighting initiative. Reporting #wildbotlesightings is, a campaign that maps littered plastic bottles to highlight the need for a UK-wide Deposit Return System. 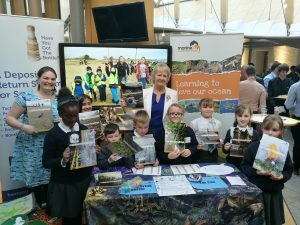 The Parliamentary event ‘Generation Earth’ was run by Scottish Environment LINK to celebrate young environmental campaigners from across Scotland as part of the Scottish Government’s Year of Young People. Together with the Marine Conservation Society, we invited these pupils to highlight young people’s interest in tackling marine litter. The event was a huge success with over 14 Members of Scottish Parliament coming to talk to the pupils and to hear about their work on the #wildbottlesighting campaign which they worked on from their playground to the beach. We even had a special visit from the Cabinet Secretary Roseanna Cunningham for whom the pupils had put on a special assembly in January to hand over the completed #wildbottlesighting report and to thank her for Scotland committing to a Deposit Return System. “It has been so inspirational working with the pupils and teachers from Our Lady’s Primary on this campaign. From the classroom, to the beach and now to Parliament, our young people are showing us all how we can stand up and fight for change to protect our seas. I can’t wait to continue working with these awesome and true Sea Champions!”. “We helped out at Catherine’s stall, had lots of fun and we told lots of MSPs and others about what they need to do with their plastic bottles when they find them”. “The young people from Our Lady’s Primary have been inspirational for this campaign. Their passion for a clean environment gives us real hope for the future, and it was great to see a queue of MSPs wanting to meet them and talk about the campaign”.